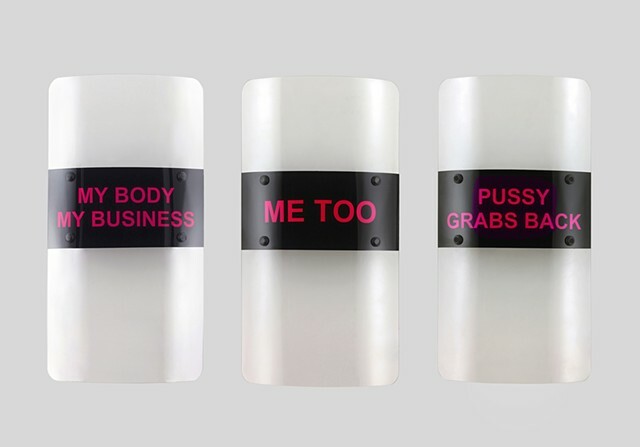 This installation will be part of the Object Action;The F Word in a Post-Truth Era exhibition in San Francisco at State Space Gallery from Jan. 6 - Feb.16. Feminist Frontline is a reaction to my experiences in Washington D.C during the inauguration of Donald Trump. During the protests attending that event and the Womans March that followed, I saw and felt first-hand the confrontation of the re-energized fight for equal treatment and the continuing evolution of a militarized police force. My piece seeks to recast the tools and iconography of establishment might as carriers of progressive messages of female power and action.